Player's woods and irons. Plenty of power. Easy to hit if you swing well, very accurate, and consistent, will hold greens if greens are holdable. All clubs feel the same. I don't hook or slice and have spent a lot of time practicing hitting a straight ball. These clubs reward that kind of a golfer as well. I was not as happy with my steel shafted driver and three wood, have preferred graphite-shafted woods for a long time. 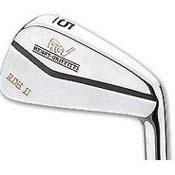 A note: my swing speed was around 105 mph when I got these clubs. It's now around 90. Just as accurate, but felt much better to hit at greater swing speed. Great feeling irons simple lines probably the most forgiving blade to hit.